Present Owner: Northern Stores Inc.
Norway House was the crossroads of the northern transport network of the Hudson's Bay Company during most of the l9th century. Three structures—the Archway Warehouse, Jail and Powder Magazine—survive as tangible reminders of the importance of this place in western British North America. 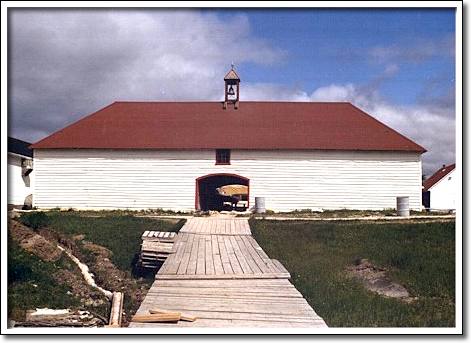 The Archway Warehouse, built in l840–l84l, is the oldest surviving Red River frame warehouse in western Canada and is Manitoba's oldest log edifice on its original site. The Jail, erected in l855–56, is the oldest extant lockup in the province. Earlier wooden structures at Upper Fort Garry and York Factory have been demolished. The Powder Magazine erected in l837–38, was the first structure built of stone in Manitoba. Though now in ruins, its style of architecture was notable for the use of cut limestone corner blocks and lintels usually found on more sophisticated buildings. These stones were quarried near Lower Fort Garry.